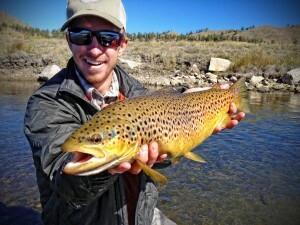 Colin grew up in Denver and has had a passion for fishing and the mountain life style his entire life. Colin’s excitement for chasing trout is obvious from the first moment you meet him. There is not a place that trout live that he doesn’t want to get to as soon as possible. Colin started with the Colorado Angler as the shop guy, and quickly worked into a guiding role. While he still fills in the shop when Andrew is out, the rest of his days are spent on the water in some fashion. While Colin’s specialty was originally the “in town” trip that is a true tailwater experience, he has since gained the expertise necessary to work confidently on all of our waters. During the heavy snow season, Colin’s passion turns to snowboarding. It is here that he has honed his cliff jumping skills (winter or summer) and his flat brim style. Colin has a twin brother that works in the roaring fork valley and they continually challenge each other whether on the river or on the snow. Beware, though, if you are out and you think you are talking to Colin, it could be his not so evil twin. The only way to tell them apart is the colors of their boats.